Best way to house/appartment break a dog is to feed the dog in the crate. The old saying you don't poop where you eat was not made up. This gets the dog to realize he has to go someplace else. Now getting them somplace else gets trickier. What I did was let the puppy stay in the crate longer then I liked but so as to get him used to it at first. If he wasn't being played with or watched by someone he went in the crate. (which was mainly late at night) My crate is in the middle of the living room in an open floor plan so it's not like he was alone much. Anytime he barked he went outside, told him to do "business" & if he did business I praised him to the extent it was obnoxious & game him a treat. No business, no treat, back into the crate. I was trying to teach him that barking meant "I want to go out." I hung a bell on a string by the front door and each time we went out I rang the bell and said "go do business?" Well one day, while playing guess who went to the front door and rang that bell? I left puppy pads by the front door for a while more but he never used them again. I had forgotten about the older Coton Newsletter's u can acess here on the website or in ur current Coton newsletter if u get it. It is a good read. It does mention instead of using vinegar use a mixture of oxi clean for floors. Which I do admit works good on our tile. I always keep it on hand & will pick it up at a Walgreens when they run on sale & if not on sale Walmart has a preety good every day price. On thing I did not mention that as I read anothers post was when they do potty outside make such a big deal out of it ur neighbors if they hear u will think ur crazy. U do not have to do it for ever but by over exaggerating ur delight 4 the action well dogs luv to please. Also their is a grass square that is put out by AKC that is a pee pad w/a tray that can be cleaned in case u do not have a yard area or easy access to a potty area. One asset to this kind of training is that if u have to travel w/ur pet most inns or hotels r more cement so this will help w/travel since it is easy to carry pee pads or paper. Thou this may sound weird but to stimulate the item to be used by ur pet use a little of ur urine on whatever u choice to stimulate ur dog to use it. Good luck. I am by no means an expert, but I think you would see an improvement if you let him out at night. If he's in the crate all night and then most of the day, then that is too long. The most important thing to Cotons is being with "their people". Try letting him out of the crate at night and see if that helps. At 1 yr old he is a little old to still be in a crate at night. U could leave crate door open at night if he wants to sleep in their but if I understand corectly we r looking at him being in their 16 hrs out of a 34 hr day. If at 1 their r still triggers that he may still chew a shoe or something pick them up so they will not be destroyed. Since a dog should have at least 2 walks a day 1 before work & the next sometimes in the evening I'm surprised he still pees that much. They do not have to be long walks 15 min ea. wil work. If u work M-F on the weekends does he get out to a local dog park? Since the smell of pee is around clean ur carpets & use vinegar & water on the tile & get rid of the smell. Then if its hard to get him outside depending on if u live in the city or so get some pee pads or use kitty litter & teach him to use alternative sources. Here is a link that could be useful to learning why a dog does what he does & how to teach a behavior. Good luck he sure is a cutie and at 1 they still r puppy's. A dog is really not grown up until around 3. I hope some of this helps but please keep us updated so if we can give u a better educated answer. Good luck. Trust yourself u will be fine. 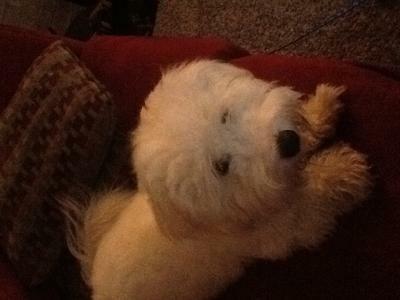 We have 1 year & 3 month old male Coton. It was a real task house training him. Your situation sounds very similar. Ollie didn't seem to 'get it' either and we were desparate. We blocked rooms off and any areas he could get to and pee. Sometimes, we would take him out 3 or 4 times an hour until he finally realized what was going on. It took about 2 to 3 weeks doing this before he knew exactly what to do. We got him at 4 months and he was about 8 months old before he was actually house trained. Ollie was crate trained, too. Be patient, and try blocking the areas in your house. Notice his actions and if you even think he may looking for a place, start talking to him and saying the words pee pee and poo poo. It made it so much easier for us to have him confined in the room we were active. He's definitely worth the effort. Cotons are very smart, but, they do have a stubborn streak!! Hi. Unfortunately, it is so hard to break habits. My little girl was peeing in the house, but we were able to break her of the habit before six months. I used the click/treat method. Have you tried clicker training? If you don't, just use the treat method, but make a HUGE deal out of his successes outside. Start by taking him out every half hour, and when he successfully pees outside, use a cue that lets him know he did a good thing. Such as saying YES enthusiastically JUST as he finishes squatting. That helps him associate the positive cue with the action. Then give him high value treats, such as cheese, chicken, etc. With Bailey, I would never let her have the run of the house for more than half an hour after peeing outside. Once thirty minutes past, I kept her on the couch with me or under watchful eye. You could even crate him. That way you could stretch it to an hour between walks. Sooner or later, magic happens, and they "get it." If you continue to build the habit to pee outside by going super frequently and praising/treating, the habit of going inside goes away. It does seem like it will never happen, but it will.